← Which Prophets Do You Hearken To? Wow, it’s time for another Week in Faith post. It seems like just last week I was writing one…oh…yeah, I was. I was actually pleasantly surprised this Sunday. Both sacrament meeting and Sunday school had a good talk/lesson that I learned from. Instead of following the usual format and starting with Sacrament Meeting I’ll start with Sunday School. Our Sunday School Lesson was about Ezekiel 34. Brother J taught our lesson today. Apparently the lesson was quite large so our teacher decided to focus on shepherds. We first discussed the attributes of the shepherd verse the hirelings. And anyone who has been in the church for more than four years can tell you the right answers. The Shepherd is willing to give his life for the flocks. The Hireling runs away because his just getting paid and he can always find another job. 2 Son of man, prophesy against the shepherds of Israel, prophesy and say unto them, Thus saith the Lord God unto the shepherds; Woe be to the shepherds of Israel that do feed themselves! should not the shepherds feed the flocks? 3 Ye eat the fat, and ye clothe you with the wool, ye kill them that are fed; but ye feed not the flock. We discussed what attributes the shepherd of Israel in these verses had. I raised my hand to give a comment but wasn’t chosen. The comment I was going to make was about a possible reason why the shepherds(leaders) of Israel were acting this way. The thought occurred to me that perhaps these leaders thought they were doing good. Perhaps even the Israelites thought they were doing good and being inspired. But perhaps these leaders saw how things worked in Babylon and thought the same principles could apply to their leading the Israelites. Babylonian principles, no matter how good or how efficient, cannot replace the principles of leadership that the Lord has given. My subtle comparison, which I wished to impart to the class, was that today we are captive to Babylon. The leaders of the church have all grown up in Babylonian captivity(Bred in Captivity. Hahaha. Sorry), as we all have. So wouldn’t it be natural for them and us to look at the Babylonian method of leading and think that is the correct way? I really don’t think the sneaking of Babylonian principles into our church would be that obvious. In fact to a generation which has grown up with many of these changes already having been made, it would seem natural for our leadership just to flow with Babylonian principles. In talking about Babylonian principles, I’m not necessarily talking about worldly values. The church still opposes inappropriate sexual activity, getting drunk, swearing, etc. I think these things are serving more as distraction from what is really going on. I’m not saying they are bad, but they are blinding us from looking at ourselves. They keep us saying, “Ha, look World, we’re different from you!” This keeps us distracted from the reality that our own operational principles are the same. I’m not suggesting a conspiracy, it’s just the nature of what is happening. What I’m saying is that the fundamental operations of the church is based upon the Babylonian system. Look at the great men of Babylon, successful businessmen. Look at the great men of the church, successful businessmen. Look at Babylon’s way of collecting money, rich and poor pay taxes. Look at the church’s way of collecting money, both rich and the poor pay tithing. Babylon gauges success by money, growth in numbers, grand buildings, and spreading out over the world. We can tell that “the church is guided by God” because we have tons of tithing money, we have rapid growth in the number of members, we are building beautiful temples everywhere, and we are spreading out over the world. Babylon looks to leaders and celebrities as wiser and more knowledgeable than we common folk are. The church looks to leaders as wiser, more knowledgeable, and more in tune with God, then we common members are. Babylonian leadership runs for the top down. In practice, so does church leadership. Babylon invests it’s money in speculation, stocks, and businesses. Guess what, so does the church. Babylon polls the opinions of the public and changes it’s image to be more appealing to people. Sorry to say it, but so does the church. I could go on all day in these comparisons but I bet you’re getting bored. What I’m trying to say is the like our Israelite brothers, we too are captive in Babylon. Their leaders probably looked to Babylon as a model for how an organization should be run. They then applied those business principles to their administration of the church. Just like them, our leaders, who are successful business men, probably apply those same principles of business to the operation of the church. And it works, if you use Babylon success as a standard. The church IS growing phenomenally. Temples ARE being build around the world. Missionaries ARE teaching people in many more places. Tithing numbers ARE huge. But guess what while these things are increasing, the manifestation of the Gifts of the Spirit are decreasing. Did you know that it is now awkward for a person to mention returning to Jackson County, in Sunday School? How about the fact those nobody gives a hoot that many modern teaching of the Church directly contradict the Word of the Lord(The worst part is that everybody still claims that none of our “modern revelations” contradict previous ones). I wonder if these last words of verse four cannot be specifically applied to us today. Do we rule with force and cruelty? If a member drank beer, would he be allowed to enter the Temple? Or what if a member of the church showed up Sunday with both his first and second wife? Would we love that person unconditionally? Or would he quickly find himself excommunicated? What if a member wanted to consecrate his surplus property in-kind? Would the church force him to convert it into cash first? I’m just wondering, because it seems to me that in order for someone to be a good member of the church they are forced to conform to a set of unscriptural standards. You can’t live the Law of Consecration and be a good member. You can’t not obey the Word of Wisdom and be a good member. You can’t be a Pluralist and be a good member. You can’t live by the revelations of God and be a member in good standing. – Open to D&C 20:50, 58 and say, “There were Elders here today, why did the Priests administer the sacrament? Why are Teachers and Deacons allowed to administer the sacrament? – Open to 89:17 and invite the Bishop to come and drink a beer with you. – Open to 24:18 and tell the Bishop you are no longer going to contribute support money for your child who is on a mission. Are we asked out of the church or certain activities in the church because our views of doctrine are different from official policy? Christ’s church would do no such thing. 12 As a shepherd seeketh out his flock in the day that he is among his sheep that are scattered; so will I seek out my sheep, and will deliver them out of all places where thy have been scattered in the cloudy and dark day. 14 I will feed them in a good pasture, and upon the high mountains of Israel shall their fold be; there shall they lie in a good fold, and in a fat pasture shall they feed upon the mountains of Israel. 16 I will seek that which was lost, and bring again that which was driven away, and will bind up that which was broken, and will strengthen that which was sick; but I will destroy the fat and the strong; I will feed them with judgment. Our teacher brought up the mountains. He and the class compared them to the temples. A member of the class thought it was amazing that this scripture can also apply to us. We are gathering Israel to the mountains(temples). While the mountains to temples comparison can be valid, we cannot overlook verses one and two. So I commented on something that stood out to me. 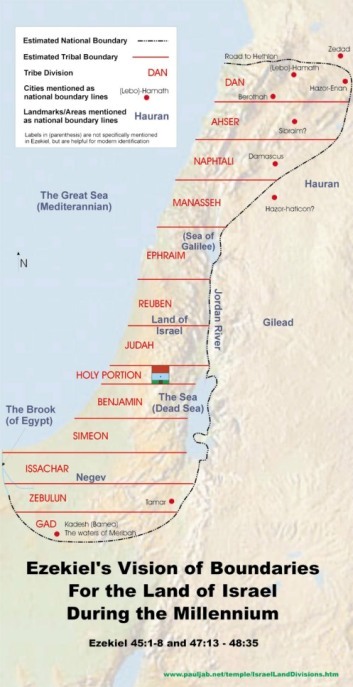 The Lord is supposed to Israel out of the places they have been scattered. He is supposed to gather them out of the countries and into their own land. He didn’t say he would gather them IN the places they have been scattered, or IN the countries where they live. The teacher asked how that can apply to us today. I spoke up again right away and said that the Cities of Zion, Kirtland, Nauvoo, etc. are our gathering places. But the topic of a literal gathering to Cities of Zion was quickly dropped. Ok, it was dropped as soon as I stopped talking about it. Seriously, I don’t get it. What is so hard to understand about gathering OUT of nations, OUT of people, OUT of countries. Then going INTO their own LAND. Do I really need to bring up the Moses comparison again? I will if I have to. The fact is that the commandment, for those gathered from the gentiles, to gather in the Land of Zion has not been rescinded! There was never a revelation to stop doing this, and if there was it did not come from God. The church moved into Salt Lake valley with the goal of eventually returning to Zion. I can even recall as a young boy, at least once, hearing that we should be ready to move back to Jackson county. Today we have become complacent in our current situation. Why gather people to Zion™ when we have the strength, numbers, and money to bring Zion™ to them? 21 And others will he pacify, and lull them away into carnal security, that they will say: All is well in Zion; yea, Zion prospereth, all is well–and thus the devil cheateth their souls, and leadeth them away carefully down to hell. The time is coming. There will be no revelation from Brother Thomas telling us all to pack up and move to a city of Zion. You want to know why? It has already been given! It was given back in 1831! You will not receive a revelation from the Brethren™ to move to Zion, because you have already rejected that revelation. The Lord has already commanded it! The shepherd has already spoken, and it is you who have not heard His words nor known His voice! I ask you to please take a careful look at the scriptures. Ask Heavenly Father about what you’ve read. This a really important topic for me. I will not let Babylon triumph over Zion. I will do everything in my sphere of influence to see that Zion is built, and the Saints have a place to be safe and rest from the evils of the world. If I have to shout from the rooftops and run screaming in the streets like a wild crazy man, I will do it. You’re a brave man to be able to continue to stomach going to Sunday School. Lately I’ve been able to learn so much more and feel a greater spirit just reading my scriptures in the chapel while it’s nice and quiet in there.